@stevesilberman @JHMarble @Square Steve got weekly emails about his @Wired article on autism for 10 years, and noticed that the media emphasis was skewed—people were arguing about vaccines instead of focusing on the day-to-day needs of autistic people and their families. @stevesilberman @JHMarble @Square @WIRED So people with autistic trait have been building Silicon Valley and the industries around it for decades. This is a place where #autistic traits and talents can be appreciated. @stevesilberman @JHMarble @Square @WIRED John just admitted that he is 42. And he said that most people his age did not have diagnoses as kids. But he was lucky in that he grew up in a small town, and educated with the same cohort of kids, who knew him. @stevesilberman @JHMarble @Square @WIRED A few years ago, while working in the Obama administration, John was trying to figure out what was going on with him, he thought he was having episodes of being “deaf” but was actually having sensory overwhelm & shutting down that channel. @stevesilberman @JHMarble @Square @WIRED @aneeman And then John went to an all-autistic retreat, and got to meet all sorts of autistic people—with ID, Down syndrome, AAC users, & more, and realized that autistic people are diverse, but share commonalities. The same was that French people are diverse but all understand French. @stevesilberman @JHMarble @Square @WIRED @aneeman At Autreat, Steve had so many of his assumptions about autistic people exploded into dust. Like about having a sense of humor, e.g., when Ari was greeted by another autistic person with “We love you Ari — if we were capable of feeling such an emotion!" @stevesilberman @JHMarble @Square @WIRED @aneeman At Autreat, everyone was so encouraged to do their own thing, that Steve found re-emerging into the NT world toxic and overwhelming. @stevesilberman @JHMarble @Square @WIRED @aneeman John on the absurdity of the “no humor” stereotype for #autistic people, when no one can even get tickets to autistic comedian @HannahGadsby’s sold out shows. So…. @stevesilberman @JHMarble @Square @WIRED @aneeman @Hannahgadsby John also asserts that everyone stims! For autistic people having their stims suppressed is like an NT person being at a rad dance concert and not being allowed to move their bodies at all. @stevesilberman @JHMarble @Square @WIRED @aneeman @Hannahgadsby John is name-checking AASCEND, a local group for autistic people and parents which has a monthly TV show. But the socializing changed the moment the non-autistic people left. Code switching for autistic people is a thing just like in any other non-majority group. @stevesilberman @JHMarble @Square @WIRED @aneeman @Hannahgadsby When Steve started looking at autism and autistic culture, he was able to identify with the cultural/outsider/marginalized/identity aspects because of growing up Gay when homosexuality was still part of the DSM. @stevesilberman @JHMarble @Square @WIRED @aneeman @Hannahgadsby John found it easier to come out as autistic because he’d already gone through the process of coming out as gay—he had a template. @stevesilberman @JHMarble @Square @WIRED @aneeman @Hannahgadsby Steve wants to know what John things companies who want to do right by autistic people/employees need to do. John: Acceptance and accommodation. Most of the managers he consults with worry about how to retain their employees. This is how. @stevesilberman @JHMarble @Square @WIRED @aneeman @Hannahgadsby And we need to stop forcing autistic kids to fit into non-autistic roles. @stevesilberman @JHMarble @Square @WIRED @aneeman @Hannahgadsby Steve: And we STILL don’t know how many autistic adults exist in the US, because we’ve never had a comprehensive prevalence study. So all those people who need support are not getting it. We do know that the UK did a study, and the kid/adult #autism prevalence was identical. @stevesilberman @JHMarble @Square @WIRED @aneeman @Hannahgadsby So when people talk about autism “epidemics” or “tsunamis” that is not only completely wrong, but it ignores all the undiagnosed #autistic people who are struggling to get by with supports and accommodations. @stevesilberman @JHMarble @Square @WIRED @aneeman @Hannahgadsby Steve: And we have to broaden our perception of what autistic people can do, because they are not all tech geeks. Many people have no interest in working at places like @Square. @stevesilberman @JHMarble @Square @WIRED @aneeman @Hannahgadsby John: Not. All. Autistic. People. Are. White. Men. That’s just the stereotype. Autistic people are as diverse as the rest of the population. And the increasing autism prevalence rates in the US mean we’re getting better at recognizing people, not that there’s an autism “epidemic"
@stevesilberman @JHMarble @Square @WIRED @aneeman @Hannahgadsby Steve: As part of his research. he realized the reason autism prevalence rates are lowest among Hispanic families in Florida is lack of access to health care, not due to lack of autism prevalence. @stevesilberman @JHMarble @Square @WIRED @aneeman @Hannahgadsby Steve: John, if you could reinvent the world to accommodate autistic people, what would you do? John: Center autistic people in autism conversations, policy, curriculum, and organizations. This is why most autism tech is junk; autistic people weren’t consulted. @stevesilberman @JHMarble @Square @WIRED @aneeman @Hannahgadsby John is done with autistic people being excluded from autism conversations. Autistic people tend to be excluded from autism conversations. This has real-world effects, because we need solutions and autistic people largely aren’t involved in working towards them. @stevesilberman @JHMarble @Square @WIRED @aneeman @Hannahgadsby John is passionate about connecting autistic adults with parents of autistic kids. He wants to buy all the parents a big box of wine. And he feels like a translator between the two groups. @stevesilberman @JHMarble @Square @WIRED @aneeman @Hannahgadsby John is talking about he and my son Leo are examples of autistic people who look very different superficially, in terms of traits, but who are actually really similar in so many autistic ways. They are very same same and enjoy hanging together. It’s delightful. @stevesilberman @JHMarble @Square @WIRED @aneeman @Hannahgadsby Steve: While not all autistic people will be able to support themselves, we need to communicate to all autistic people that they can have a great future. @stevesilberman @JHMarble @Square @WIRED @aneeman @Hannahgadsby When Steve spoke at UN world autism day, he met a guy who was diagnosed with autism at age 70. Steve asked him what people thought he was before his diagnosis. His answer? “An engineer." @stevesilberman @JHMarble @Square @WIRED @aneeman @Hannahgadsby John likes to show parents autistic ppl who are successful, but also wants to be honest about the current challenges are. But he sincerely believes that all autistic people could probably have better supports than they have now. Society needs to change its priorities for autism. @stevesilberman @JHMarble @Square @WIRED @aneeman @Hannahgadsby The problem for most autistic people who are seeking jobs is the employment/interview process. It’s not autism-friendly. The culture needs to change. Because the skills needed to succeed in a job often have nothing to do with autistic interviewability. @stevesilberman @JHMarble @Square @WIRED @aneeman @Hannahgadsby This is why John started @PivotDiversity, to change the culture of Silicon Valley, tech, and other industries to accommodate autistic and neurodiverse potential employees. Because until that happens, everyone is losing out on opportunities. @stevesilberman @JHMarble @Square @WIRED @aneeman @Hannahgadsby @PivotDiversity Autistic people are not down for exclusion and often walk off panels when there isn’t sufficient representation. @stevesilberman @JHMarble @Square @WIRED @aneeman @Hannahgadsby @PivotDiversity @CosmicKarmic …and then @CosmicKarmic ran into co-worker @cjereneta, who was wearing a #neurodiversity shirt. And they connected about their families. Plus it was the first time anyone had told CW he didn’t need to apologize for the way he communicated. @stevesilberman @JHMarble @Square @WIRED @aneeman @Hannahgadsby @PivotDiversity @CosmicKarmic @cjereneta @drdebah Steve: Important to note that the DSM 5 is the first time autistic adults had input on the autism diagnostic criteria. @stevesilberman @JHMarble @Square @WIRED @aneeman @Hannahgadsby @PivotDiversity @CosmicKarmic @cjereneta @drdebah Steve: People ask him which orgs to support since Autism Speaks is not good (euphemism), and he tends to recommend @autselfadvocacy (as do we). @stevesilberman @JHMarble @Square @WIRED @aneeman @Hannahgadsby @PivotDiversity @CosmicKarmic @cjereneta @drdebah @autselfadvocacy John: Professionals need to learn from autistic people, because most of them don’t really know much about autism (esp. doctors/therapists) and so helping autistic people is going to be really challenging in those circumstances. @stevesilberman @JHMarble @Square @WIRED @aneeman @Hannahgadsby @PivotDiversity @CosmicKarmic @cjereneta @drdebah @autselfadvocacy Steve: Only 2% of the autism research outlay is on lifespan/QoL because the mainstream approach to autism is all about pathology. And so we keep overlooking autistic people who don’t fit typically-perceived autism molds. @stevesilberman @JHMarble @Square @WIRED @aneeman @Hannahgadsby @PivotDiversity @CosmicKarmic @cjereneta @drdebah @autselfadvocacy John: A lot of autistic people don’t like Autism Speaks because they spend less than 2% of their budget on Lifespan/QoL. But we have to have empathy for parents who listen to the mainstream narrative bc it dominates & it’s hard to find good information. Kind @threadreaderapp, please unroll. Thank you. @AutismAdvoCat @stevesilberman @NeuroRebel OK. F*** that. Get ready for a thread. Getting ready to listen to Bryna Siegel on @KQEDForum, re: autism & the new prevalence rate. Fun fact: I had lunch with Dr. Siegel & two autistic friends a few years ago. She talked about some of her theories for her new book. They both told her she was wrong. She ignored them. @KQEDForum So even though Dr. Siegel has had “more than 40 years of clinical experience” with autism, if she ignores autistic insights, her opinion on autism is flawed. @KQEDForum “Diagnosing for dollars” is absurd. We know from research that, if anything, #autism is under diagnosed, especially in girls, people of color, kids from low SES scenarios. Yes, there is always a small % of diagnostic error, but that is a dangerous misdirection. I'm listening to the @USPTO Business Method Partnership Meeting (the 16th event). Anyone interested in a live tweeting? Go to uspto.gov/patent/cpm to get all the partnership data for the various technology areas. 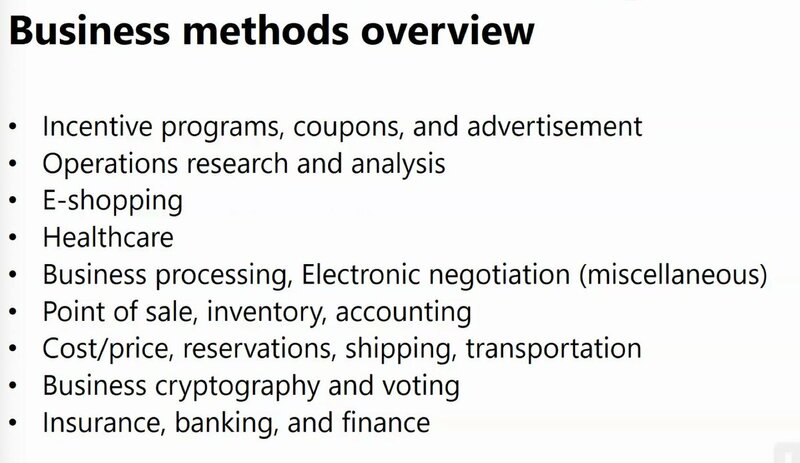 This these all the Business Methods groups. Social networkings, planning is included under business processing. Well, here it is, #WorldAutismAwarenessDay. So I wish to remind the world that #autism has been recognized for only about the past 70-some years, but people have been #autistic a lot longer than that. #Autistic people have made significant scientific advances throughout history, most notably in medicines, technologies and energy sources that we unthinkingly use every day. Many autistic people have elevated senses, and are likely to react unexpectedly and poorly if they're overstimulated (i.e. meltdown). #Autism, diagnosis, self-diagnosis, services: Quick thread. I've seen a few questions around this on Twitter in the last few days. THREAD! Now that everyone is looking, wanna to learn some history about RVA's racism? @theValentineRVA has a series called #ControversyHistory that explores our difficult history. TOMORROW the topic will be #healthcare disparities. This include's medical college graverobbing. 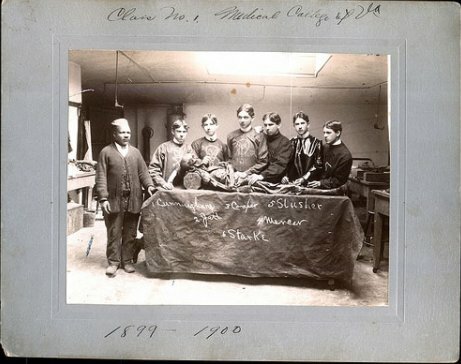 In December, on our weekly show #MUNICIPALMANIA, we spoke with Dr. Shawn Utsey about his research documented in Until the Well Runs Dry regarding the history at the Medical College of VA of using black bodies in the name of medical advancement. Part of Utsey's research was around a man named Chris Baker who was the medical college's anatomical man. There is a well documented history of Baker stealing bodies for the medical college. 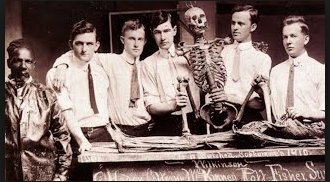 In 1882 Baker & med students were caught grave robbing together & Governor pardoned them. The one autism & parenting approach I want folks to absorb for 2019: if your #autistic child is violent or aggressive then that usually means something is really really wrong with them, health or environment-wise, and you really need to figure out what it is—for everyone’s sake. It can be really, really hard to figure out the source of an autistic kid’s (or adult’s) extreme distress. But you know what makes it harder? People assuming aggression is "because of autism,” & not because something is wrong. And then so much avoidable suffering happens. This is why you don’t want to listen to #autism “experts" who recommend “extinction,” punishments or aversives for kids who are aggressive, without even bothering to figure out why they might be in pain or other distress—because that is ignoring/punishing someone who needs help. This is probably the best thing I have seen in forever. "Autism rights and neurodiversity advocates see the traditional conception of normal and abnormal conditions as an example of privilege and discrimination, and draw parallels with other movements for greater acceptance of diversity, such as the LGBT rights movement."